With the excitement of Christmas and a New Year out of the way many of us experience the "January Blues" and are often left feeling sluggish, overweight and tired. January has to be one of my least favourite months of the year, especially as my bank balance is looking rather depressing after Christmas and it's cold which certainly doesn't help. Instead of staying indoors and feeling sorry for yourself, make plans with friends to get out of the house and do things! Whether it be a cinema trip, a pamper session, lunch or a walk, just by making plans you will have things to look forward to and take your mind off feeling unmotivated. If you really don't feel like going out at least don't cut yourself off from your friends online, be social! Having a bad hair day? Book yourself into the salon and get a trim! You could even be brave and get a completely new look! By getting a fresh cut you can feel 100 times better about yourself, and then you'll want to get out and show it off! How about treating yourself to some well deserved treats after the Christmas period? That palette you've being eyeing up, new mascara you're thinking of splurging on, January is the perfect time to grab some new makeup, and treat yourself to a revamped look. Whether this is some new make up, a couple of DVDs, some new shoes or a bag make sure its something for you! If you're a parent and always spend your spare money on your kids it's time to treat yourself! A holiday gives you sometime to look forward to and psychologists believe that even looking forward to a holiday can do you the world of good. The anticipation of a holiday can make you feel excited by releasing endorphins which are your bodies natural feel-good hormones. So go on book a holiday and count down the days till you go! Even planning a holiday and looking at different destinations if you can't afford to book one just yet can increase your happiness. If you're feeling lethargic you may be thinking you're too tired to exercise, truth is you need to fight it and get up and be active! Once you get moving you'll feel so much better! This doesn't need to be an hours run or a spin class, you could go for a brisk walk, or even take up a yoga class. If you do wish to start the gym this is the perfect time to do so although any type of movement in your body is good as it will start producing more endorphins which is what we want! Feeling at a loose end in the evenings or weekend? How about starting a new hobby? Not only is this a great way of keeping your mind active but you can also make some great friends! Been thinking of starting a cooking class, learning how to crochet, or how to take great photos? Go on what are you waiting for? Go and do it! So what if it's raining? Stop making excuses! Lack of daylight is partly why people suffer with the winter blues. We all know that the fresh air does you the world of good and the bad weather is no exception. Put on some wellies and your raincoat and brave the rain, take a walk and enjoy the great outdoors! Not only will it help with your mood levels it will also help you sleep better at night which is an added bonus. It's easy to get stuck indoors glued to your smartphone, TV or laptop during the colder months because you don't feel like going out in the dark, miserable weather. This needs to change! Force yourself to switch off from these disturbances and limit yourself from using them during the day and evening. Perhaps you could turn off your smartphone at 10pm so you have time to unwind before bed, or instead of watching TV read a book. By having something exciting to save for it can improve your mood instantly. Whether it be a holiday, a weekend away with the girls, a new bag or a shopping spree think of something you really want to save up for, grab yourself a money jar and get saving! You could even take part in a money saving challenge such as the 52 week challenge or the 365 penny challenge to see you save money across the space of the year. Is your house feeling and looking messy or cluttered? I know my house is especially cluttered after Christmas, so I always like to have a big clear out and donate some unwanted goods and also sell some other bits I have been planning on getting rid of for some time. I recently had a clear out and sold some baby items I had put in the attic out of the way and made £500 for my holiday fund! If you hate the hassle of selling your items think of the end result, you'll have some extra money to spend on what ever you like or you could save it instead. What helps you stay positive in January? 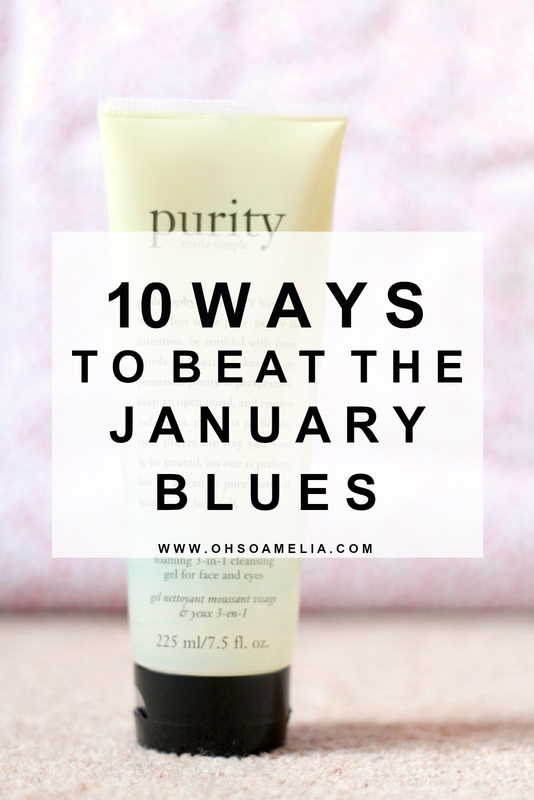 How do you combat the January blues?